You may have your own children as a couple or you may have children from earlier relationships. 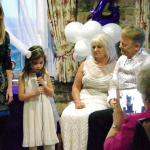 Or you may have grandchildren or other children who you are especially close to in your wider family or friendship group who you want to involve in your Ceremony. I am often asked for ideas and we can always find something which works for you and the child involved. 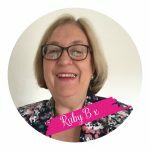 Here are my ten favourite ways of including children in your wedding or vow renewal ceremony – but there are lots more. 1 Mention children in the Ceremony. This is the simplest, but often most important, way to include children in your Ceremony. Especially if you are bringing together a blended family. It’s important for children to know that they have not been forgotten and that you recognise that your commitment includes them too. Make sure your officiant recognises how important this is to you. Even the silkiest teenager who won’t get involved in any other way will appreciate a mention. Just don’t expect them to say so! 2 Have children as ushers. 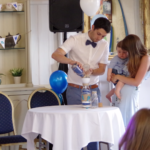 Even relatively small children can hand out orders of Service, tell people where the toilets are and ask guests to take a seat in their own way. Two gorgeous little sons of the bride at one wedding interpreted being told that they should tell people they could sit anywhere in Church handed everyone an order of Service with the words “Sit where you like”. This role can also be one of holding a sign for smaller children. Older children could be given the role of playing the music during the ceremony as an extension of the usher’s role. 3 Include children in the wedding party. 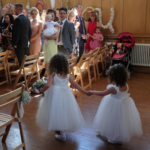 A traditional way of including children in your wedding is to have them as flower girls or Page boys. 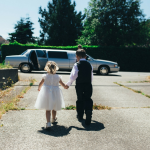 These are still ideal roles for small children with older ones as bridesmaids or groomsmen. 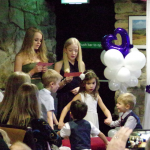 However nowadays children also can be found taking on the roles of bridesmaid, groomsman, chief bridesmaid or best man. The role of ring bearer or bouquet holder are ideal for quieter children who may not want to or be able to walk down the aisle. An adult should be given the job of keeping an eye on them so that the rings and bouquet are passed on at the appropriate time. 4 Make vows to your children. Becoming part of a blended family can be worrying for some children. 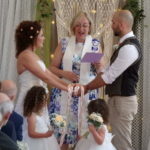 It is important to reassure them that they are loved and that this Ceremony should mark positive commitment to them as well as between the Happy Couple. Making vows to them as well as to each other is one way of doing this. 5 Present gifts (often after the rings have been exchanged). The Happy Couple can present the children with symbolic gifts. These might be the gift of a rose which can later be pressed and kept, or a piece of jewellery such as a ring, bracelet, necklace or watch. Or it might be a badge or medallion made especially to commemorate the day with a symbol to represent the inclusive love of the family. Inviting all of the children to sign a commemorative family certificate is a way of involving them which does make them feel too awkward. Not all children like to be the centre of attention but I have found many are happy to quietly take part in a certificate signing. 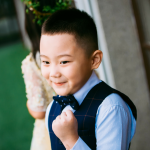 If one of the children has a talent such as being a good singer or plays a musical instrument or dances beautifully and they are happy to do this in public then let them have a spot in the ceremony. This could be done during the signing of the register/certificate or another appropriate time. 8 Ask them to do a reading. There are many readings which would be suitable for children of different ages to read in a ceremony. If the child agrees then spend time with them to make sure that they are happy with the reading. Then ensure they practice it until they are confident – but not so much that they are fed up with the reading before the day! 9 Include them in a Unity ritual. There are lots of unity rituals such as sand and candle rituals or a “tie that binds” ritual which children can be involved in. Each person in the family has a part to play and the end result is a unity object which can be kept as a momentous of the day. 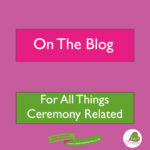 You can find out more about the individual rituals elsewhere on The Blog. 10 Involve the children in a Handfasting. Children can be involved by presenting individual coloured ribbons which are then fast around the couple’s hands and wrists. 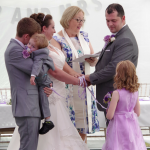 Children can also hold pre braided cords during the Handfasting words or blessing. These are just a few ways to include children in your wedding or vow renewal ceremony. Each child is unique as each couple are unique. So it is important to find something which really suits the child and the ceremony. If you want to talk through your ideas do get in touch.